1. If I set links, the links are not always available in a pdf file created from the afpub-file. 2. If I crate a list with bullets and give the first word(s) another color (e.g. it is a link), the bullet gets the same color. I did not find a way to change the color of the bullet independently of the text. Is this a bug or is there a way to manage it? Thanks again! This depends on the type of PDF you export - some PDF variants do not support hyperlinks. For those that do, click "More" in the export window and make sure "Include hyperlinks" is checked. But the links don't work properly. If I have a URL, for example xyz.com/document.pdf, and put the same URL as a link, it works. But if I have any text and put the link there, it doesn't always work, although it is placed in the afpub-file. (See the attached pdf. All "Foto X"-Texts have a link, but not all work. If you look in the right column, it says "Department of Theological Concerns der Weltweiten Evangelischen Allianz". After that there is a URL. Although the URL is "www.worldevangelicals.org/pdf/....pdf" and is set in the same way in afpub, the page "www.worldevangelicals.org" is called. But the links don't work properly. Not sure how you created that, but the link does not cover all of the text that is formatted as a link and does not point to the intended page. Make sure you have selected the text that should be linked, then right-click on it and from the context menu go to Interactive -> Create Hyperlink and make sure that the displayed URL is the one intended. Note that the displayed text for the link (what appears in "print" on the page) does not need to match what it actually links to, so if you try to edit the text within the document, that does not change the target of the link. Also, the formatting is independent of the link. While there is an option when creating a link to select a character style to apply and the default one gives you blue and an underline, you can just as easily change the formatting after creating the link or apply the character style to something that is not a link. From what I am seeing in your PDF, it almost looks as if you had a link to the www.worldevangelicals.org then added the rest of the text after the link, inheriting the character style, but never made it part of the link itself - either part of the displayed text of the link, or part of the target of the link, each of which needs to be modified separately. Those are three different things (formatting text to look like a link, which part of the text is the link, and the target of the link). If I use Adobe Acrobat Reader DC, however, the site is blocked, and if I allow it, the link opens at the home page. The tooltip for the link in Adobe Reader, shows the page to which it leads. I suspect that the line-wrapping in the URL is the problem. 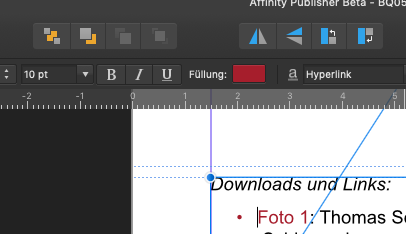 I think you have not added a hyperlink in Affinity Publisher, but have simply typed the URL as text, which Adobe Reader does not convert to a URL correctly, but PDF-XChange Editor does. If I select the text in your Imported PDF in Affinity Publisher, and apply the URL to hyperlink, it turns blue. The link in the exported PDF then points to the right target. If I select the text in your Imported PDF in Affinity Publisher, and apply the URL to hyperlink, it turns blue. This is because of the character style that is selected by default when creating the link. A different style can be selected instead or the default style that is created could be updated to match the formatting that is desired for the particular document. It sounds like you may be creating the links correctly and they are not being exported with the PDF but the reader you are using is trying to reconstruct them from the text and only seeing the first line. This could be further validated if the ones that are not working as expected are the ones that happen to span multiple lines. Maybe try using the "PDF (for web)" preset in the export window and see if that works? PDF reader applications typically have a setting to enable "convert URLs to links" - so disable that if present. Then you can see what APub has actually exported in the PDF.